When I was doing my exploration of St Pancras and Islington Cemetery last week, I came across this delicate-looking, lilac-flowered plant. For all its seeming fragility, it was doing a great job of scrambling across the brambles and the bindweed. When looked at closely, it’s easy to see that this is a member of the pea family – the anchor-shaped hooks at the end of each frond of leaves are used to attach to whatever happens to be close by, and later in the year the plant will develop pods, each containing tiny ‘peas’. 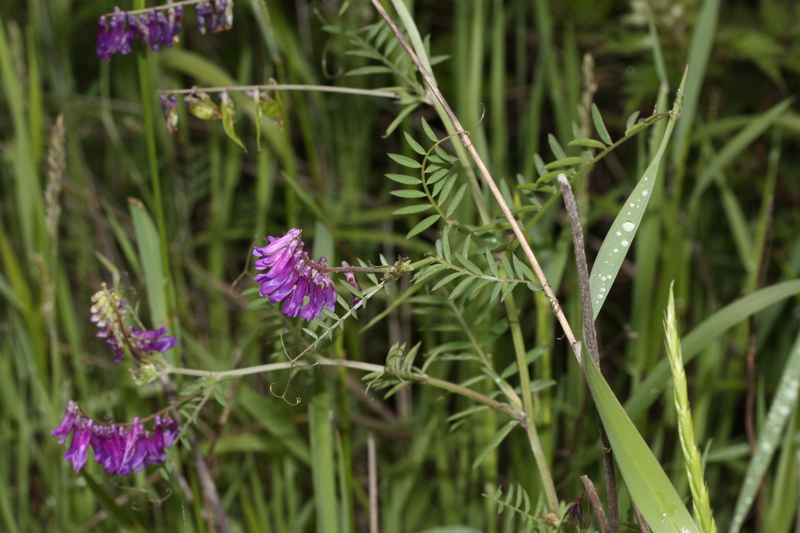 A close look at Tufted Vetch makes clear that it is a type of pea…. 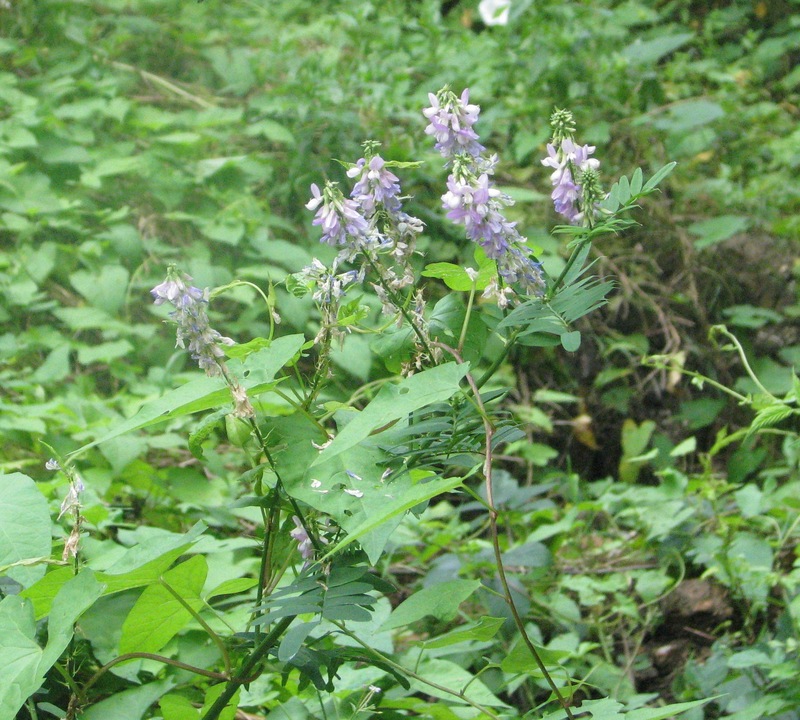 Like all peas, Tufted Vetch fixes nitrogen in the soil. It does this because its roots contain nodules in which a bacteria called Rhizobia lives. While the plant is alive, the bacteria produces nitrogen compounds which help it to grow, and to compete with other plants. When the plant dies, the nitrogen is released, making it available to other plants and hence helping to fertilise the soil. As nitrogen is one of the building blocks for DNA and for proteins, this is vital to the health of the whole ecosystem. Another name for Tufted Vetch is Cow Vetch, because it has been widely used as forage for cattle. Like all members of the pea family, it is also a great favourite with bees. The plant is native to Europe and Asia, but has been introduced to North America, where in areas of prairie it can be more vigorous than the native plants, crowding them out, and is therefore sometimes viewed as a detrimental weed. I find this a little surprising – although it is a scrambler, Tufted Vetch doesn’t seem much of a thug, certainly not when compared to plants like Bindweed. ‘I often think I would love to cut one of these combinations with a single swipe of a sickle and put it all in a vase’. I know what she means, but how much nicer lay on your back in a meadow, look at the tangle of flowers and watch the ladybirds and butterflies going about their business. This entry was posted in London Plants on August 13, 2014 by Bug Woman. Vetch, trefoil, and the lot are lovely! I love them too, Marla…all creatures (humans included) owe a lot to the pea family! Hi Jiri, thanks for your comments! 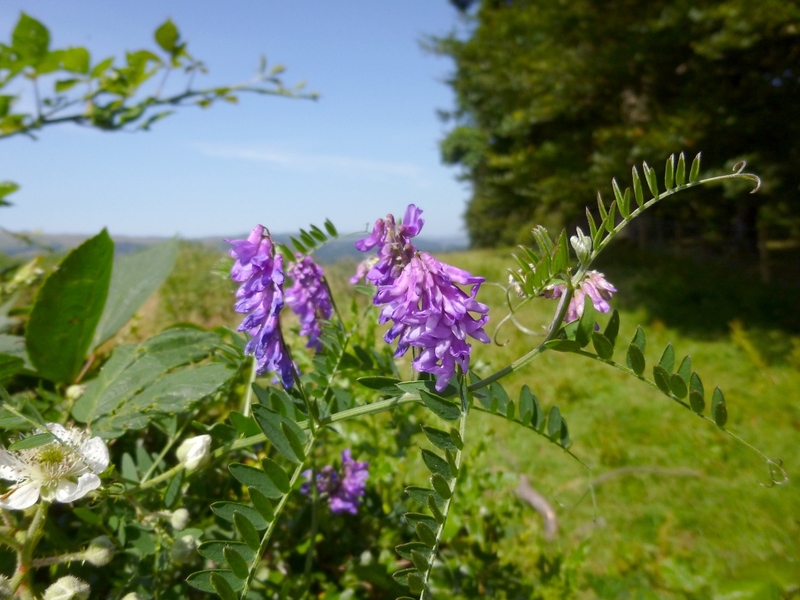 I’ve had another look at my post, and I agree that the Vicia is a Galega – in fact, I discovered another of these plants growing not a quarter of a mile from this one, and did a separate post on it. And I suspect you’re right about the Elecampane/Telekia, though how it appeared in my garden I have no idea! Both of these were early posts, and I know a (little) bit more now, but it’s always good to talk to someone who knows a bit more :-). I love Prague by the way – I’ve visited for pleasure and for work, and always find something new to be delighted by.